The EVA JM custom-handmade acoustic guitar built by Kevin Pederson is truly a "Piece of Art". My first impression of the guitar was this is a beautiful, high quality custom guitar. Then I inspected the details of the guitar and I realized I was wrong this was the craftsmanship of a true, "Master Luthier". Detailing, detailing, detailing throughout the guitar is astonishing and reflects the workmanship of this Master Luthier. All of the woods from the Flamed Koa, back and sides to the Bear Claw Spruce soundboard and the Maple Neck are absolutely stunning. The koa bindings and abalone inlay add a precision finished touch that is unlike any guitar I have ever seen. The cutaway and cutaway bevel make a smooth, totally uninterrupted playing area above the twelfth fret. The Beveled Arm Rest is not only unique but this is the most comfortable guitar I have ever played. You can definitely feel the difference when you play a standard acoustic without the bevel. The visual details, although "Flawless", only add to the most prominent feature of the EVA JM that is the "The Sound, WOW!" The EVA JM has strong, deep tones and sustain that project full bass and treble tones equally throughout the neck. When picking hard the guitar does not distort, it just gets louder. Truthfully, I did not know this feature existed because I have not seen it in other acoustic guitars. The balanced full tone and clarity of the EVA JM acoustic guitar is found all the way up the neck in every position and the dreaded acoustic buzz is non-existent with this neck design. The Sound Port adds a sonic, almost "Stereo Effect" when playing by myself. The bone nut and saddle add to the tone and super sustain of the guitar. Altogether the overall sound of the EVA JM is unequalled. I also added a Sunrise Pickup to my acoustic for amplification. Kevin Pederson added an awesome Koa cover to match the Koa on the EVA JM. In conclusion, the EVA JM is more than I expected. 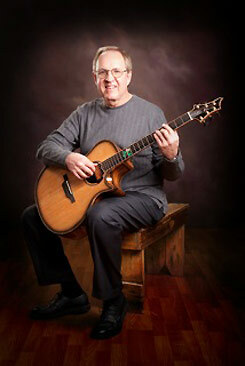 Kevin Pederson is truly a "Master Luthier". The inlay on the EVA JM is the personalized White Rose on the twelfth fret. This has extra special meaning to me because my son has two electric guitars also made by Kevin Pederson with the White Rose. I guess it is a father and son thing. Working with Kevin Pederson, has been a very rewarding experience. If you are looking for a super sound and magnificent detail all in one, I highly, highly, highly recommend the EVA JM acoustic guitar by Kevin Pederson.